Wow - can you believe it's almost the end of August? Where did the time go? As summer is wrapping up it's last few weeks, I wanted to go back and make another card using our Campfire Tails stamp set! 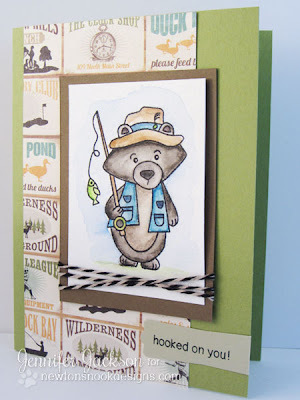 Although camping is mainly a summer activity I think this fishing bear could be used for nearly any time of year - especially if you know someone who likes to fish! Both my father and my father-in-law are big on fishing so I can see using this set to make cards for them! To create this card I stamped the bear on some watercolor paper and colored him using Inktense colored pencils and a water brush. I really had fun coloring him. I love how vibrant those pencils are... you get the watercolor look but still have that bright color! I just color around the inside edges of each part of the image and then very lightly across the rest. Then you use a water brush to move and blend the color around. 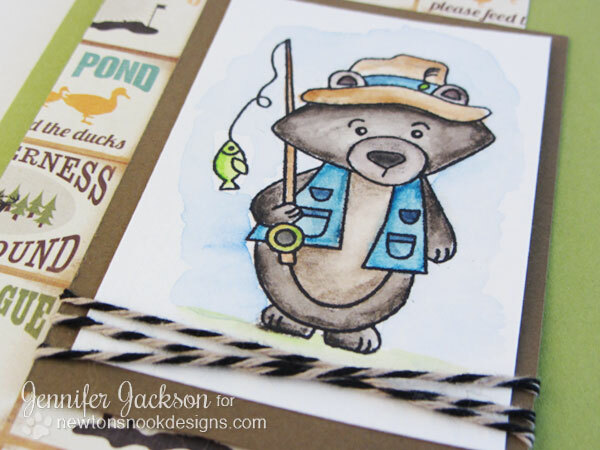 I also used some patterned paper from my stash that had an outdoors theme and used the "hooked on you" sentiment from the same stamp set. Is anyone going fishing or camping this weekend? Make sure to pop back over to the blog tomorrow for details and brand new sketch!! This is really cute! I think this is such a sweet set. May have to put this on the Christmas "Wish List." The colouring is great .Love the blue shading around cute image too .